What were the very first things you ever learned? Unless you are Mozart, they were probably things like walking, talking, using a spoon and a sippy cup. You learned these skills from someone who knew how to do them well, like your mum or your older brother. And you learned them by watching, watching intently. Check out how a baby or a toddler watches — it’s like a lion on the veld or my dachshunds as we unpack groceries. Unblinking, rigid with attention. Oh, and speaking of Mozart, how do you think he became a prodigy at three? He watched his older sister take harpsichord lessons and he watched his father play the violin. It’s no coincidence that so many prodigies, from Michael Jackson to Wayne Gretzky, were the youngest kids in large families. Lots of people to stare at and learn from. When you learn this way, you create a vision of yourself performing the skill, a mental video you play over and over. As the scene loops, it is burned into your brain, creating new neural pathways and locking in the nuances of the skill. You notice not only the steps the experts take but the intensity and rhythms with which they perform the action, the way that all the component parts of actions come together into one cohesive and coordinated whole. In time, these observations lead to fluid and confident motions. Learning a physical skill is a very complex process, most of it nonverbal. You are programming your head and body to dance together in a thousand little ways. You must keep refining those dance steps, polishing them until there are no hitches or hesitations, until they run like greased, teflon-dipped clockwork. That’s how you learn to walk, to dribble a soccer ball, to drive a car, to play the guitar, and to draw. You program neurons. If you want to improve your golf swing, watch Ben Hogan on YouTube. If you want to improve your jump shot, watch LeBron during this week’s NBA finals. 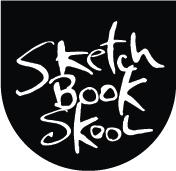 If you want to improve your drawing, watch any of my Sketchbook Films or the demo videos on Sketchbook Skool. Watch them again and again. And don’t watch passively, like you were dozing off in front of a Seinfeld rerun. Sit forward, engage, focus, mimic, stare. Let your body respond as you watch. Feel your muscles tense, your fingers twitch. Throw yourself into it and absorb the rhythms, the linkages, the unspoken logic behind the scenes. Your meat computer takes longer to train than silicon chips, but it lasts longer too. Once you have forged these connections, they will last a lifetime. Neglected, they may get rusty and overgrown, but, with a little practice, you can prune them and get them up and running again, like a long forgotten stretch of railroad track. You never fully forget how to ride a bike. And the same holds true for the network you’ve built between your brain, eyes, and hands so your pen will make lovely marks in your sketchbook. Stare, engage, mimic. And repeat. Touché! You got it, Danny. Nice piece. You can learn a lot by just watching intently, over and over again. A little more listening and watching is respectful to ones other senses. Filling in space with talk-talk is denial. Great drawing along with pertinent text. My watercolour technique (while still in it’s infancy) improved quite markedly, almost from one day to the next, after watching some videos with Charles Reid, with paper in front of me, dropping in colour to things as I saw him do. Strangely, and despite the relative success of this learning experience, I’ve never taken the time to reflect that it could be something I could do overall to improve! One of your great skills is to distill some of the essence of what helps us all to be better learners, in any domain – thanks for that! You should see him do it in real life. Charles Reids has a magic paintbrush. I was lucky enough to sit NEXT to him TWO days when he painted portraits. AmAzInG!! I’d referenced this piece in a blog post of mine about how John Lennon could throw together a song because he had years of practice in developing his music. Creatives tend to forget that it’s not enough to be creative, we have to practice it too. I’d left a link to my post as I have other good links in there too. The John Lennon one is towards the bottom. P.S. Am really enjoying art Before Breakfast. I’m not into drawing, but I find it applicable to my creativity and a great encouragement. Danny, It’s funny that you wrote this, I always tell people that raising children is NOT “do as I say, but not as I do.” Your actions speak louder than words. We try to tell our children this as they raise their own….now that I am a grandparent, I definitely see things differently as an observer. I just read Joseph Zbukvic’s book and it was amazing. I took what I learned and sketched my whole vacation, keeping in mind things learned in sketchbook skool and things I read in Zbukvic’s book. I kept a daily record in my sketchbook and I am soon proud of myself that I had a daily record of our vacation. Somewhere along the line I did figure out that I learn best by observing people who know how, but I never caught on to the Youngest Child Advantage, unfortunate elder child that I am. Still, it is a bang-up rationale for taking lots more workshops, so thanks for that. Then again, there’s the Turkish proverb, “If skill could be gained by watching, every dog would become a butcher.” – A meat butcher, that is. Not a serial killer butcher of course. But seriously, well said. There was a study done recently that I read about on the Internet, so of course it’s true. It was with two groups of basketball players. For one month, one group only visualized making free throws while the other actually practiced. At the end of the month there was no discernible difference in the abilities of the two groups. So even thinking about drawing might improve our skills. Loving your drawing. I’ve been missing that part of your blog. I would tell new kindergarteners to watch and do what the rest of the class. Those who did it were able to be fast learners. There is research now showing that those afflicted with “memory impairment” as they age (dementia, Alzheimer’s, etc.) will retain longer those muscle memories learned earlier — be it music, drawing, knitting, etc. So learning to draw (or play an instrument, or knit) can increase your participation in living as you age!